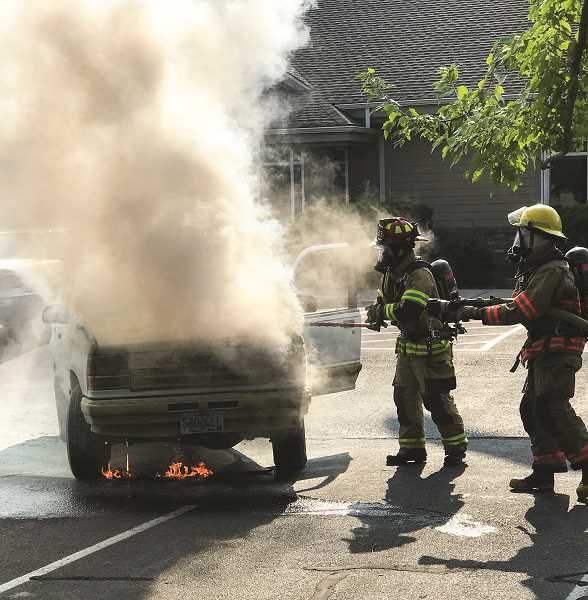 A fire erupted under the hood of a Ford Explorer in the Crook County Library parking lot early Tuesday evening. According to Prineville Police Cpt. Larry Seymour, who responded to the incident with Officers James Young and Jordan Uppendahl, police were told that the owner tried to start the vehicle and as the engine tried to turn over, smoke began to pour out of the hood. The owner, whom police did not identify, reportedly got out, popped the hood and saw smoke and flames. He promptly closed the hood and called 911. Seymour said that Young used one complete fire extinguisher on the fire, which slowed it down but didn't put it out. Uppendahl then used another extinguisher, yielding similar results. "To avoid damaging any other cars, and before the flames hit, I grabbed the owner's keys to unlock the steering wheel lock, and let it roll back into the middle of the parking lot to avoid damaging the other cars parked next to it," Seymour added. Crook County Fire and Rescue then arrived on scene and extinguished the blaze. The vehicle was reportedly a total loss.